This degree explores science in its varied and complex forms and we train you to study science and scientists as part of modern society. We combine science policy, ethics, and governance, science communication, and sociology of modern science and technology. UCL is unique in the UK in offering this BSc. D3,D3,M1 in three Cambridge Pre-U Principal Subjects. AAB at Advanced Highers (or AA at Advanced Higher and BBB at Higher). Successful completion of the WBQ Advanced Skills Challenge Certificate plus 2 GCE A-Levels at grades AAB. Modules in science policy and governance are local and global in scope. They engage with ethics, historical decision-making processes, governance of emerging technologies, and future directions in science, medicine, and technology. Modules in science communication focus on the complex interactions between scientists and the public. We consider the methods of science journalism, including radio and television and online environments. Practical modules in public engagement and evaluation build hands-on skills with communication and conversation. You will also develop the skills of evaluating the effectiveness of science communication: what works and what doesn't? Modules in sociology of modern science and technology engage with classic sociological theory and practical field methods to study science as a human activity, shaped by modern society. This programme aims to produce graduates ready to talk about science and interpret its influences in modern society without committing to a life at the laboratory bench. Science involves many more people than scientists themselves, and this degree seeks to build policymakers, communicators, and other observers who can contribute informed views to ongoing debates about science’s direction and impact. This might involve contributing to debates on science funding or ethics; weighing the value of different social priorities; or consulting on the impact of new technologies and new discoveries. There are no optional modules in year one. There are no compulsory modules in year two. Our intermediate- year optional modules vary from year to year to reflect current practice and the latest academic research. Students may also select options from a wide range of optional and elective modules offered by the department and throughout UCL. Our final-year optional modules vary from year to year to reflect current practice and the latest academic research. Students may also select options from a wide range of optional and elective modules offered by the department and throughout UCL. The department has a reputation for excellence in the classroom. Tutors have won local and international teaching awards and we consistently rank highly in student evaluations, obtaining 100% student satisfaction for the STS degrees from the National Student Survey in 2016, 2014, and 2013. Our teaching methods adapt to specific needs of students. Many modules include small-group discussions and active participation. The student-to-tutor ratio is approximately 10:1. Coursework ranges from short position pieces to significant research papers. In addition to essays, we sometimes assess using posters, blogs, and multimedia projects. Practical work includes mock parliamentary reports, radio programmes, presentations, and web projects. Group work sometimes is used, as are unseen examinations. 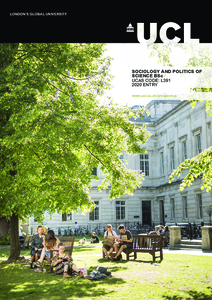 Detailed course descriptions are available on the department website: Sociology and Politics of Science BSc. The programme is designed to enable you to gain understanding of the discipline, and to develop intellectual, practical and transferable skills, such as critical thinking; retrieving, researching and analysing material, time and project management and working effectively both independently and as part of a team. In this scientific and technological world, this programme provides an excellent foundation for many careers, especially those at the interface of professional science and the wider culture transnationally. Our graduates go on to develop successful careers in the areas of science policy, think tanks, charities, science communication, journalism, education, museums, finance and law. Many also go on to pursue further study. Your application will be assessed on your prior and predicted academic achievement, and we will be seeking evidence of your interest in historical and contemporary issues in science and technology. You should also be able to demonstrate your ability to construct a reasoned argument and to participate in debate. After assessing your application, we invite applicants in the UK to visit the department for an open day. This includes introductory talks from staff and tours given by current students. The afternoon meetings with academic staff provide an opportunity to discuss your personal interests and aspirations in relation to your chosen degree. If you live outside the UK, you are not expected to travel for an interview, but will be contacted by telephone or email or Skype to discuss your application and your interests - you are, of course, welcome to visit us if this is possible for you.